Pork chops find their way on my dinner table about once a week. My family's favorite recipes are in the rotation, but every once in a while I slip in a new recipe. 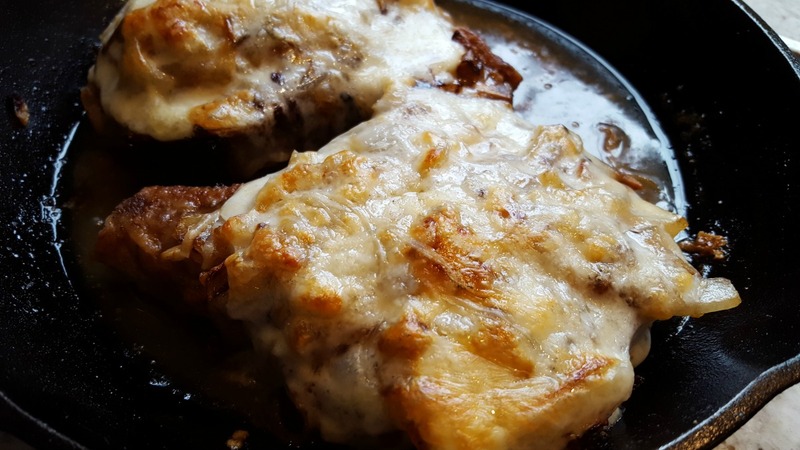 This Pork Chops with Onions and Provolone Cheese recipe is new and is a winner. It is easy to prepare and packs much more flavor than you might anticipate from the ingredients. You'll want to choose bone-in pork chops for this dish. The flavor is enhanced with bone-in chops. You'll also want to use a skillet that can go from stove top to the oven at 400 degrees F. I choose to use a cast iron pan for dishes like this. You'll want to use a 12-15 inch skillet when making this with four pork chops. I love my cast iron pan. The ingredients are easily accessible. 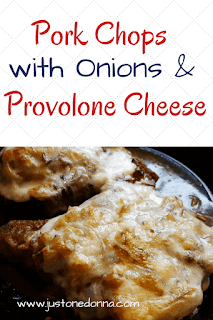 All you need is flour, salt, pepper, fresh garlic, onions, white wine and provolone cheese. You'll only dirty one pan as you move the preparation from stove top to the oven. Don't you love that? I'm all about easy cleanup. The entire prep to serve time for this dinner is approximately one hour, with a good portion of the time spent waiting. That means you can pour yourself a glass of wine and chill while your dinner is cooking. Preheat your oven to 400 degrees F. Mix the flour with 1/2 teaspoon of salt and 1/4 teaspoon of black pepper. Spread the flour on a plate. Dredge the pork chops in the flour mixture. Brush off excess flour. Heat the olive oil in an oven-proof skillet over medium heat. Place the chops in the pan. Cook the chops for 4-5 minutes on each side, until browned. 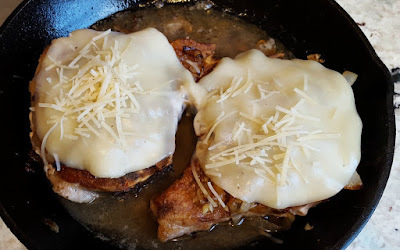 Remove the pork chops to a plate and cover to keep warm. Add the onions to the pan. Season the onions with a little salt and pepper. Cook the onions for approximately fifteen minutes, stirring occasionally to ensure even browning. When nicely browned, add the garlic and cook for one minute. Return the pork chops to the pan and top each pork chop with one-quarter of the onion and garlic mixture. Pour the wine around the pork chops. Bring the wine to a boil. Top each of the chops with a slice of provolone cheese. Place the skillet on the center rack of your oven. Cook for another 10-15 minutes, until the pork chops reach an internal temperature of 145 degrees F. Let the pork chops rest for five minutes before serving. Get more yummy recipes on Meal Plan Monday. Thank you for sharing this recipe on Facebook, Pinterest, Twitter, and Yum! Have you followed my Facebook page? Looks and sounds absolutely delicious! I will be trying this! I'll be trying this too. It sounds wonderful.